I’ve always thought of churches as quiet places full of whispers, but St John’s Wood Church in London was shouting tonight. I don’t know if I believe in God but, if he is up there I think he would have noticed one Joji Hirota banging on his door tonight. I’ve just come home from “Beyond the Requiem”, a charity concert to commemorate one year since the Great East Japan Earthquake which hit the Tohoku region of Japan. Photos and recordings weren’t allowed at the concert, so you’ll just have to take my word for it when I say it was amazing! 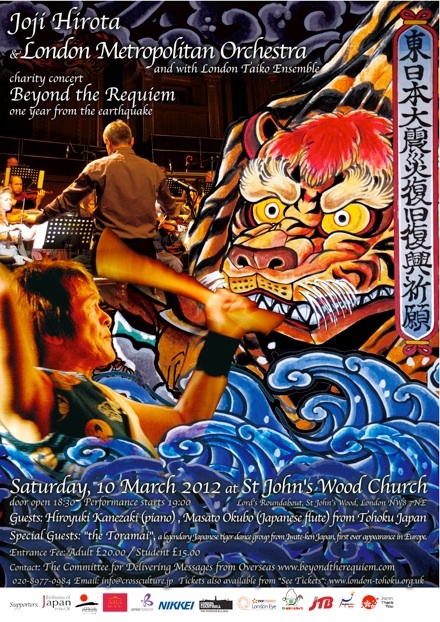 The £20 ticket price almost put me off, but it was worth every penny to hear taiko played in a church with such passion. I knew the acoustics would be good, but I could never have imagined how good. And it wasn’t just taiko. Joji was joined by the London Metropolitan Orchestra and a number of special quests. Together, they played soulful folksongs, featuring vocals from Joji and Japanese flute from Joji and Masato Okubo. Seeing Joji’s London Taiko Ensemble was the reason I went tonight, but the highlight was actually The Toramai. The Toramai are a group from Iwate Prefecture. They performed their 830-year old tiger dance for the first time ever in Europe. The dance involved four people dressed as two tigers, dancing traditional folk music. The dance was originally for fisherman. Tigers were believed to safely travel very long distances in a single day, and the Toramai began to spread amongst local fishermen as a prayer for their safe journey. It was also believed that tigers possessed special powers to prevent or extinguish fires. Consequently, the Toramai was performed as a fire prevention ritual along the coasts in Tohoku, where fires (mostly due to earthquakes) devastated large areas. Nowadays, Toramai performances are held at celebrations like village festivals and New Year’s Day. People believe that watching the Toramai brings them luck and happiness. I’ve never seen The Toramai before and could only liken it to Chinese lion dances. It was very exciting, and there was such character in the tigers’ faces. Joji Hirota will be touring in Japan in June. He will take his London Taiko Ensemble and the London Metropolitain Orchestra to Tohoku to play the special pieces he has arranged for the people recovering from the disaster. 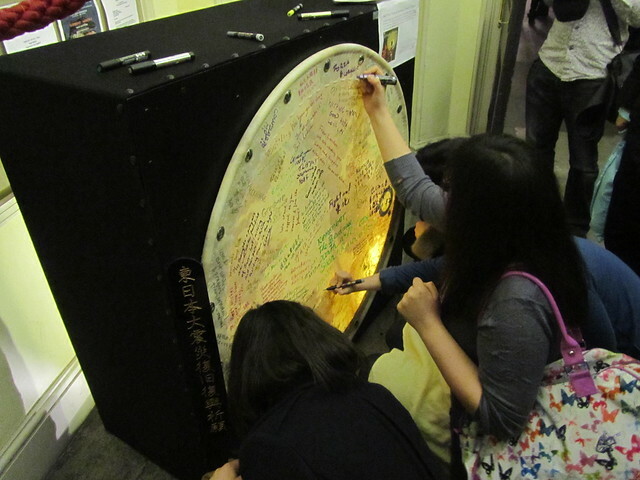 Tonight, there was a big taiko drum being signed, and this will also be taken to Tohoku. Concerts will be played in concert halls in various locations around Tohoku, and also in schools. I don’t know the exact details of the concerts in Japan, but I’m sure if you keep an eye on Joji’s website you will be able to find out soon.